After a good night’s sleep we opened the shutters to discover a beautiful blue sky. The weather forecast of thunder and lightning seems to have avoided us, at least for the morning. The Hotel Christine has an extremely high rating on the hotel website and up till breakfast we hadn’t thought it anything particularly special. 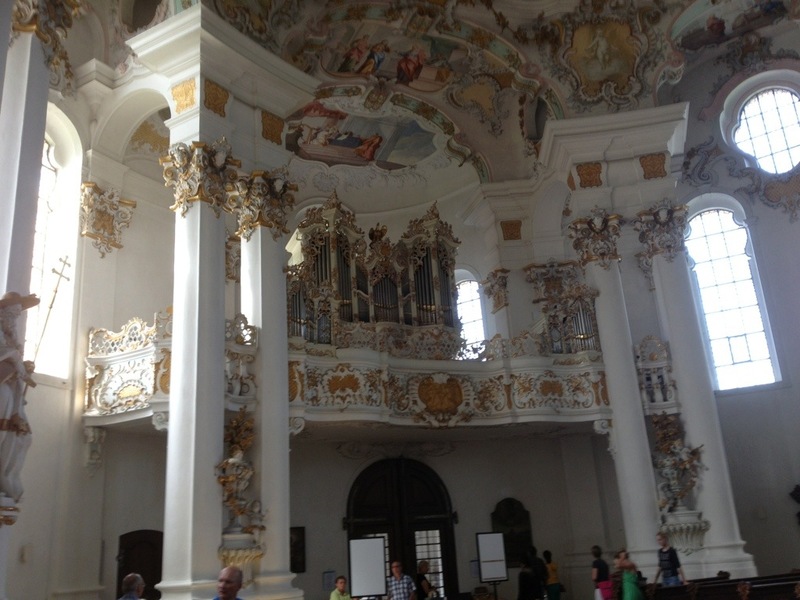 It was a nice hotel but like many others I have stayed in in Germany which only warrant 8/10. Hotel Christine was 9.2/10. 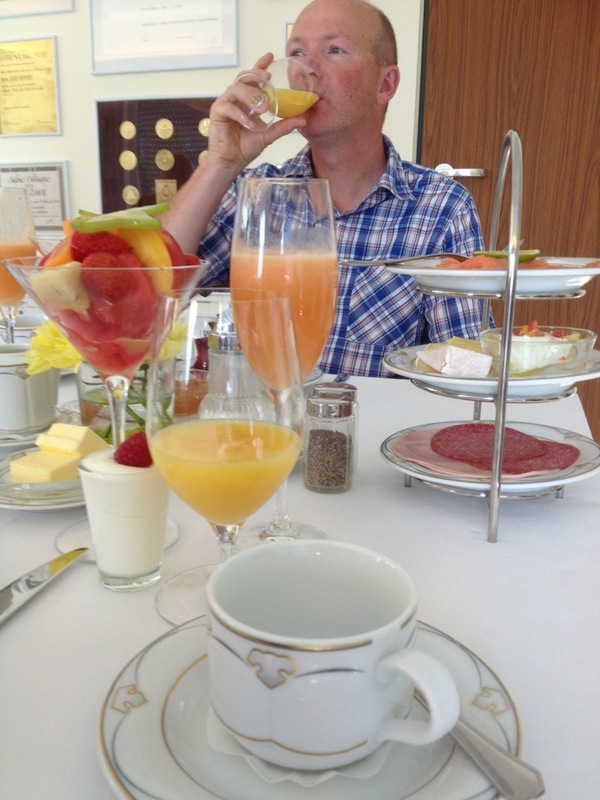 However, when we went down to breakfast, the reason for the 9.2 rating became clear. They also bought over a basket of bread and rolls and a plate of scrambled egg each. 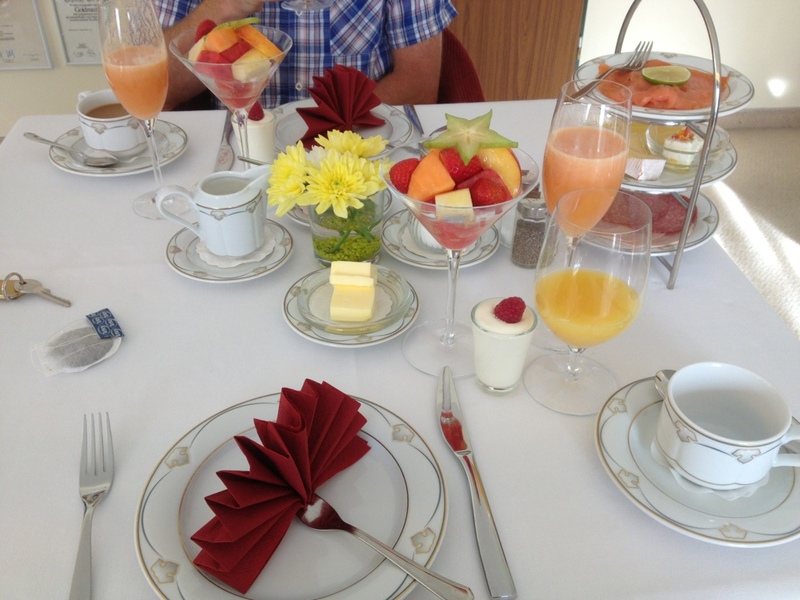 Everything was absolutely delicious and we probably managed our five a day fruit and veg just this morning! Our washing had not quite dried overnight as we had ended up wearing our cycling kit until eight in the evening, but hopefully it will finish drying tonight. 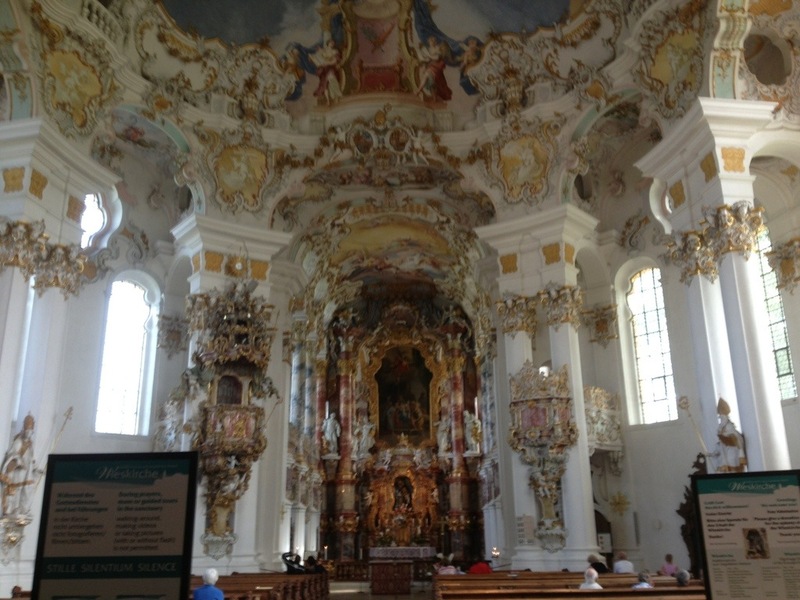 The forecast for after this weekend is cooler with a bit more rain so we will make the most of today’s great weather as we cycle 32 miles, taking in what is considered the most beautiful Rococco churches in the world, the Wieskirche at Steingaden. 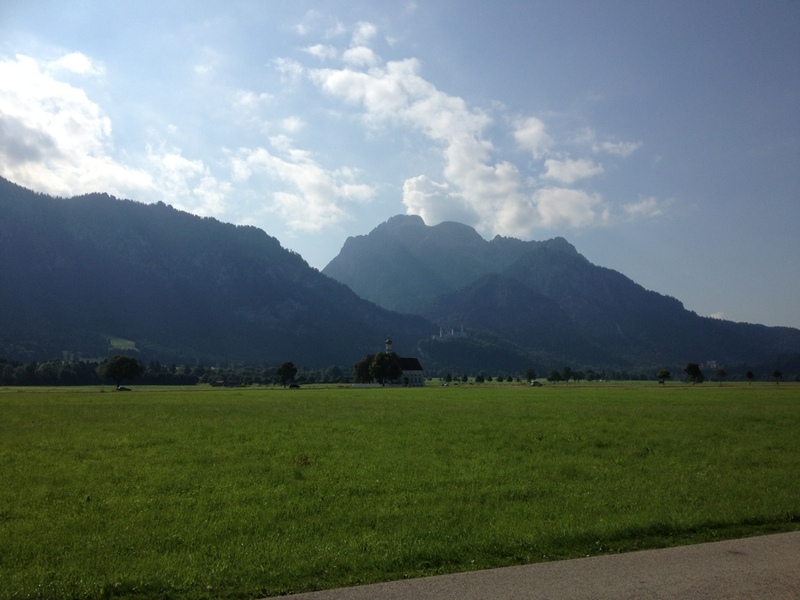 We set off at 10 AM in beautiful sunshine, retracing yesterday’s route towards Neuschwanstein although cutting a corner and missing out the main route to the castle. 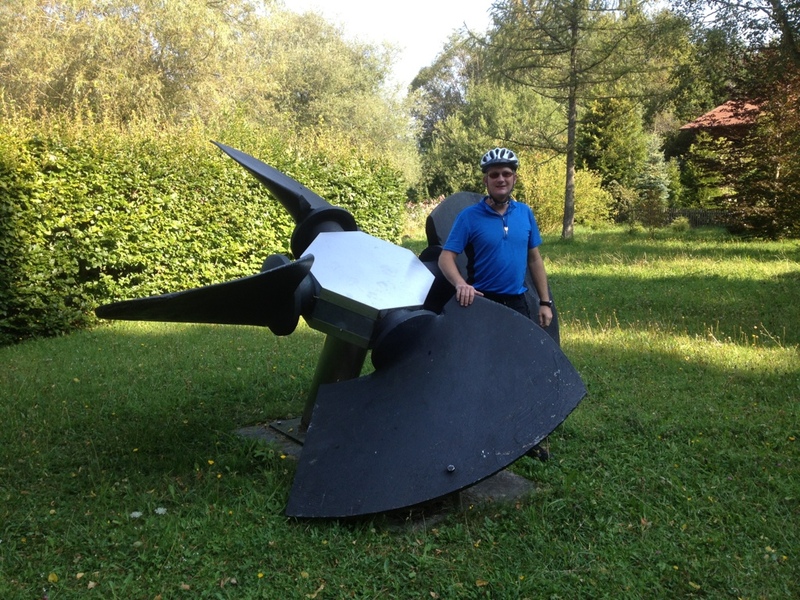 James posed beside this huge propeller near the hydroelectric plant. 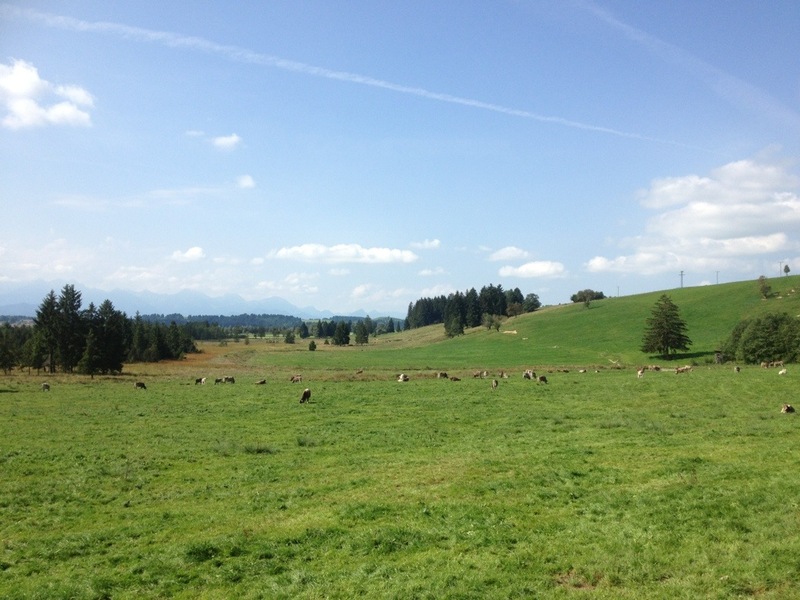 We were heading north easterly for the first few miles, running alongside the edge of the Alps with them always to our right. 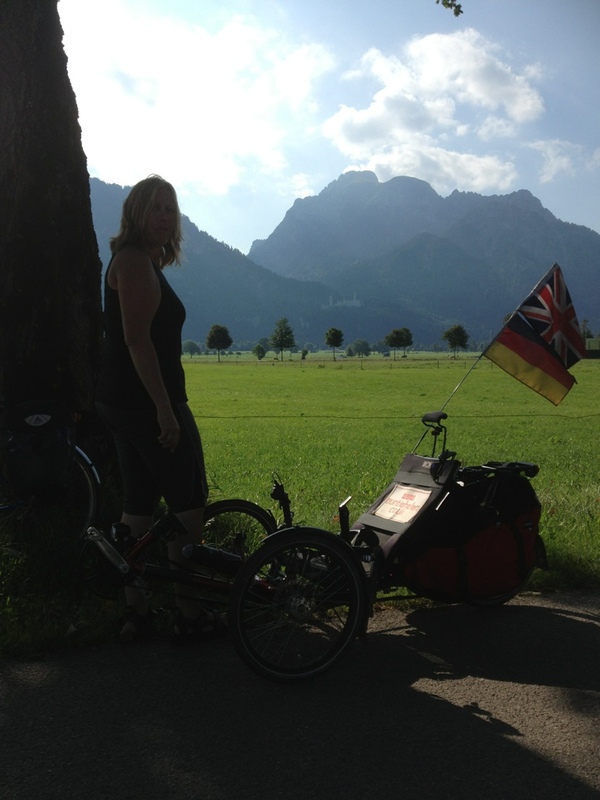 Here I am with Neuschwanstein Castle in the background. We cycled on what must be an old floodplain and saw to the right hand side the St Coloman pilgrimage church built in 1673. 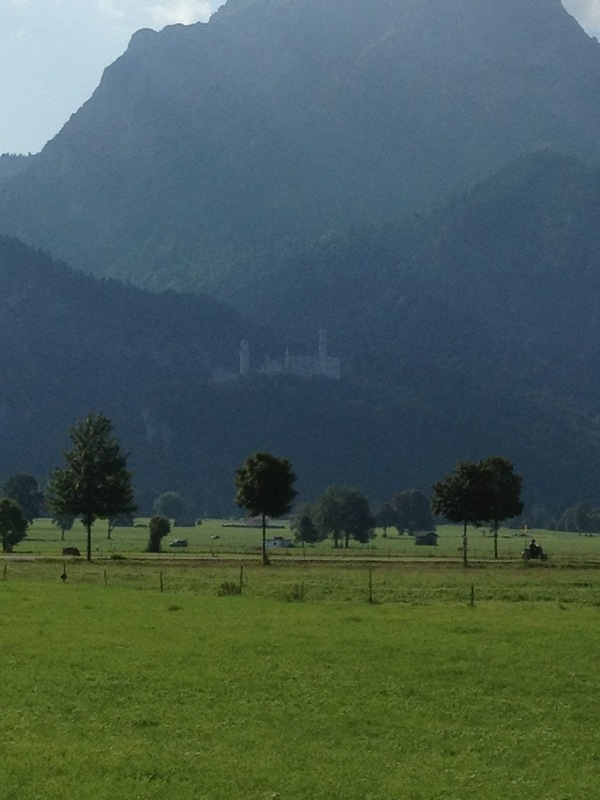 Neuschwanstein Castle is visible behind it. As the weather was good I decided to take off my mudguards and see if they would fit in my panniers – they did! 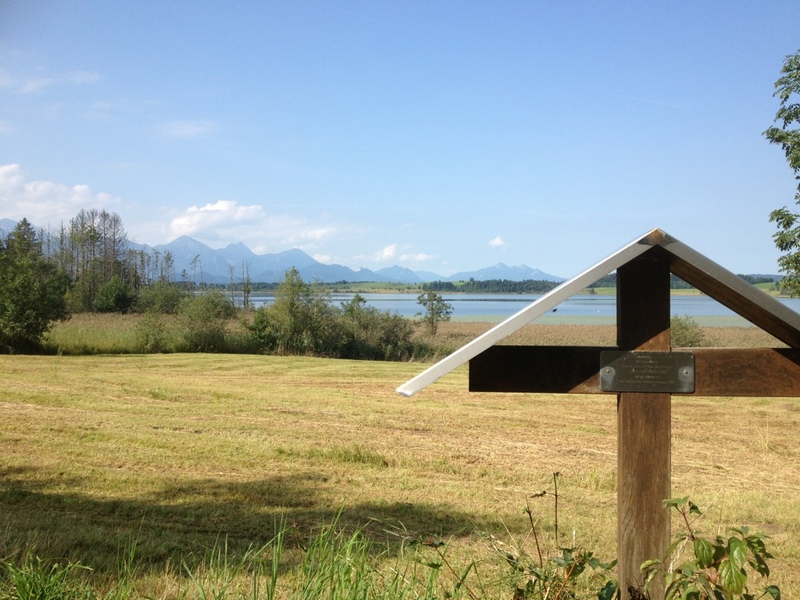 The route took us past the Bannwaldsee (lake), the smaller of the two lakes near Füssen, with views across it to the Alps behind. 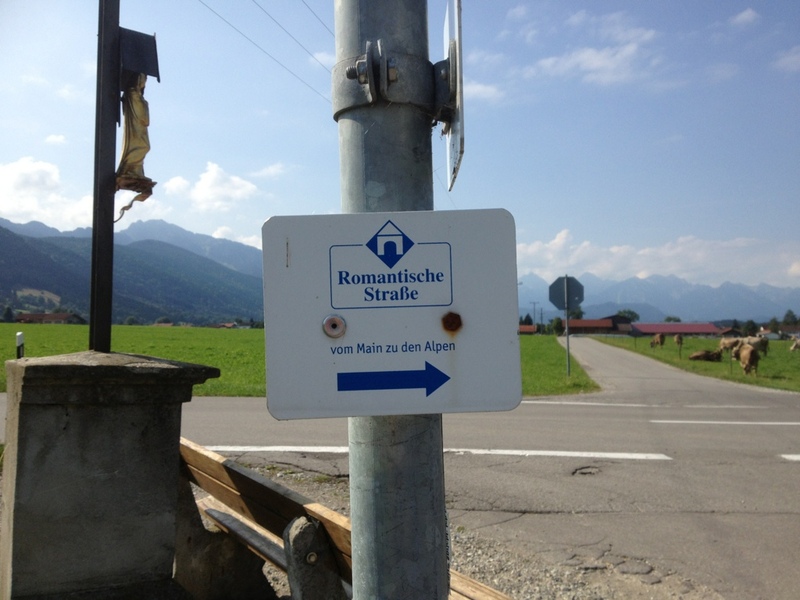 We were slowly getting our eye in with regard to the signposts as the little signs for Romantische Strasse seem to be quite hard to see. Here you can see the sign just above James’s shoulder. We continued on, making a small detour to a village in which our guidebook said there was a bike shop. The bell on my bike had broken on our train journey and it’s really useful to have a bell when out cycling in Germany on busy paths. We found the shop but it was closed – undoubtedly they were out cycling instead, and I didn’t blame them on such a beautiful day! 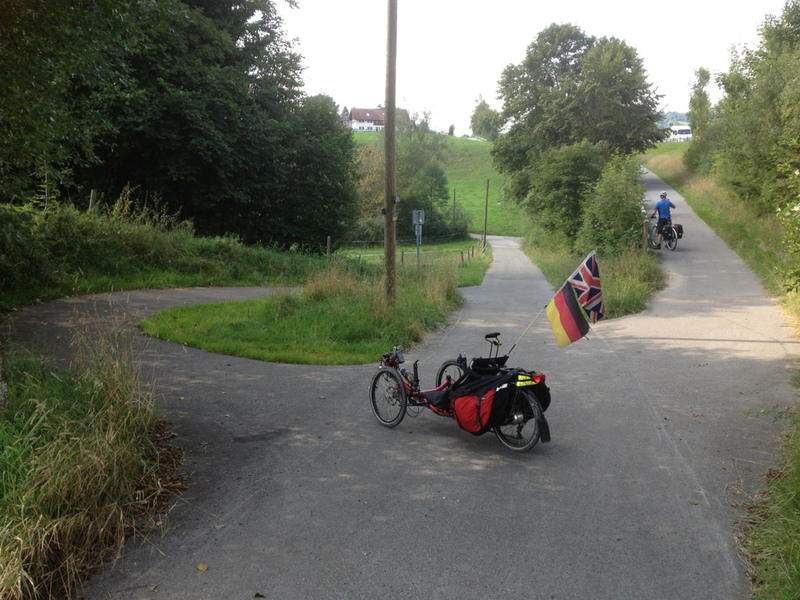 The route continued on but unfortunately changed from asphalt to loose chippings, something that you often find in Germany and which is a pain in the neck for a three wheeled bike like mine. This carried on for a couple of miles which meant we were going a lot slower. There were also some fairly steep up and down hills which slowed me down/sped me up so we were moving at a fairly variable pace. The views were always lovely though so we were happy to trundle along slowly, even if it was getting a bit hot at times. 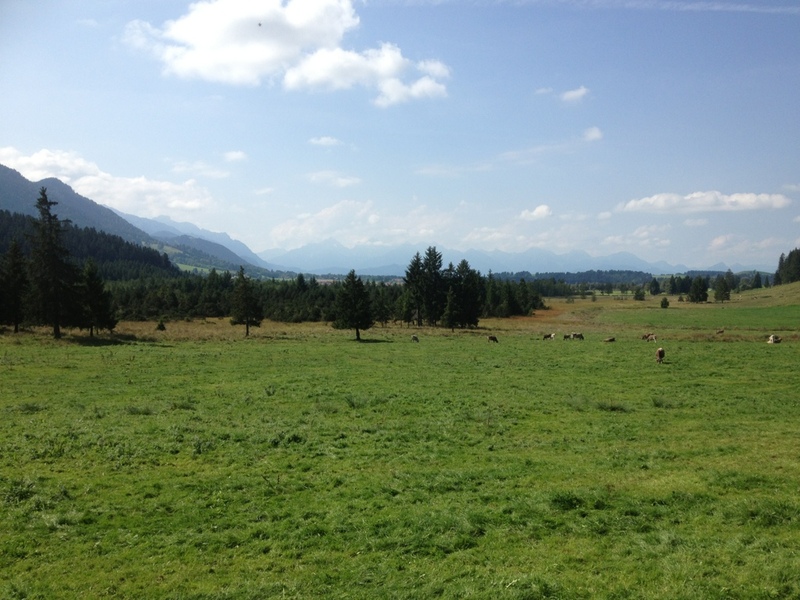 These photos were taken near Trauchgauer-Ach, as is this panoramic video with cowbell accompaniment. Here James went ahead up a hill to see the view whilst I trundled up in a very low gear. 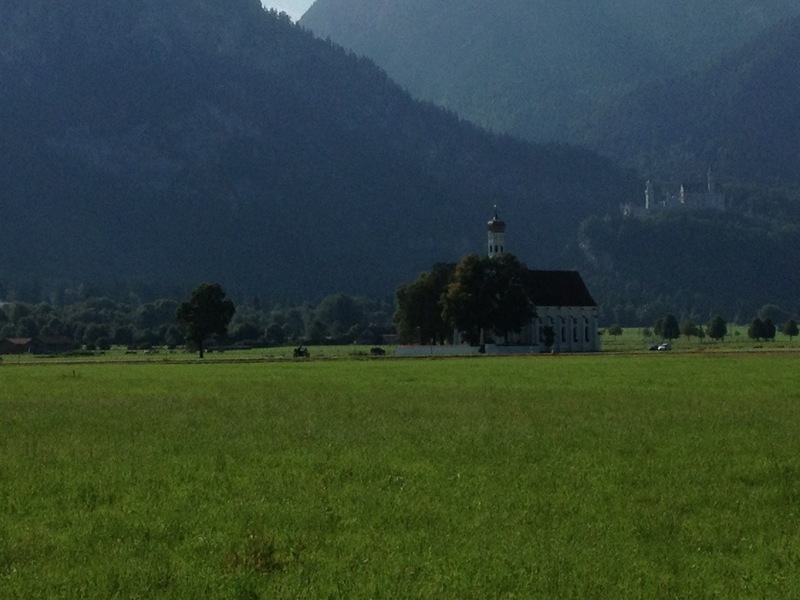 My Garmin said that we were at 2870 feet, having started at Füssen at 2500 feet. 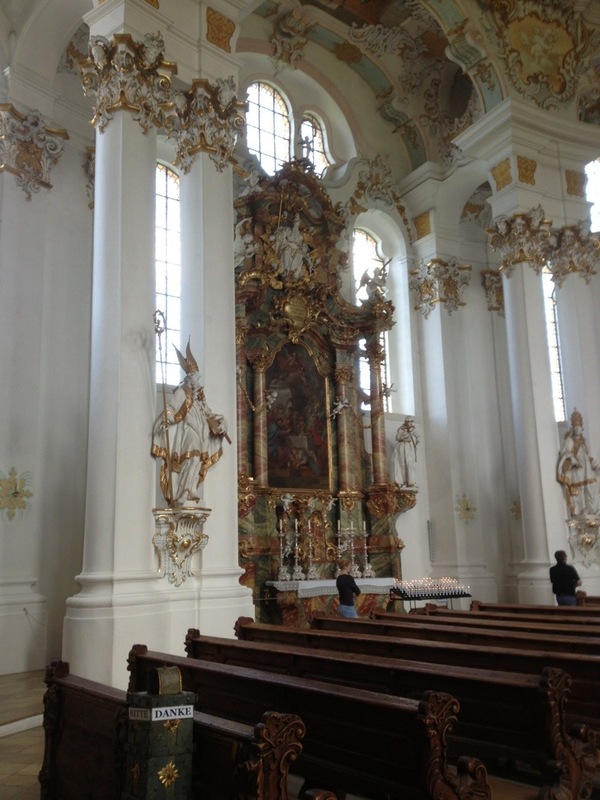 We were heading for the Wieskirche in Steingaden which is one of the most famous rococo churches in the world. 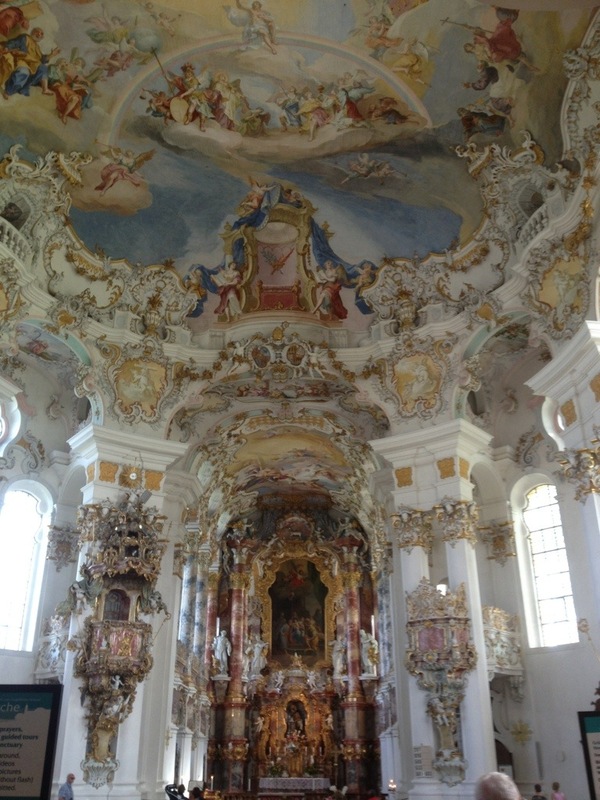 It was awarded world heritage status by UNESCO in 1983 and as soon as we stepped in we could see why. 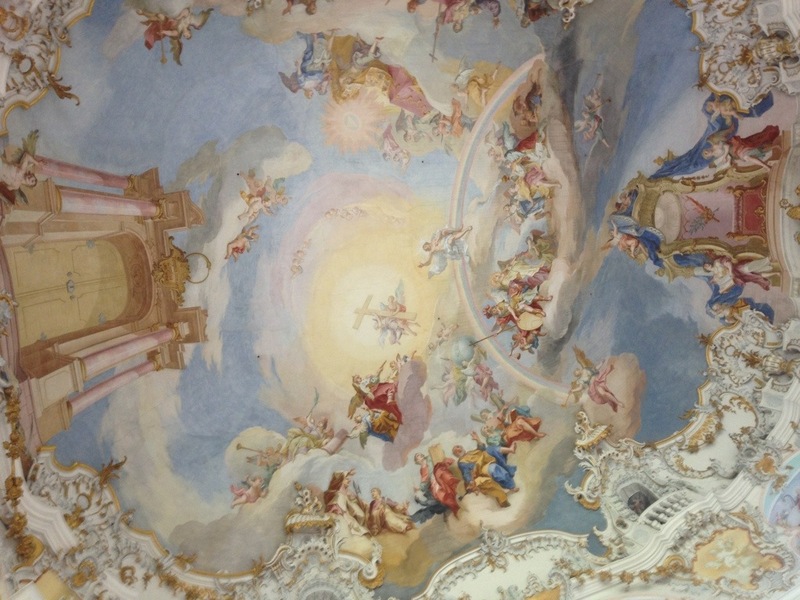 The church is famous for Johann Baptist Zimmermann’s ceiling fresco in the trompe l’oeil style. 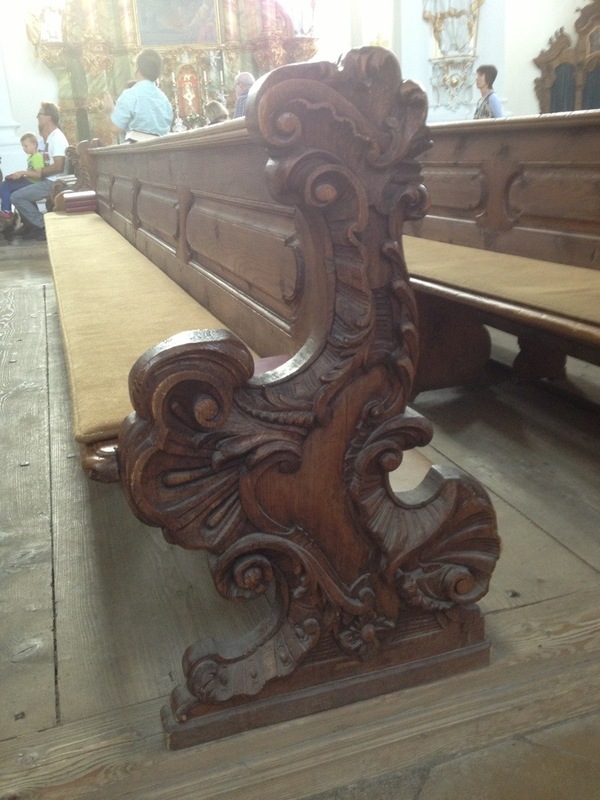 Even the pews had beautifully carved ends. 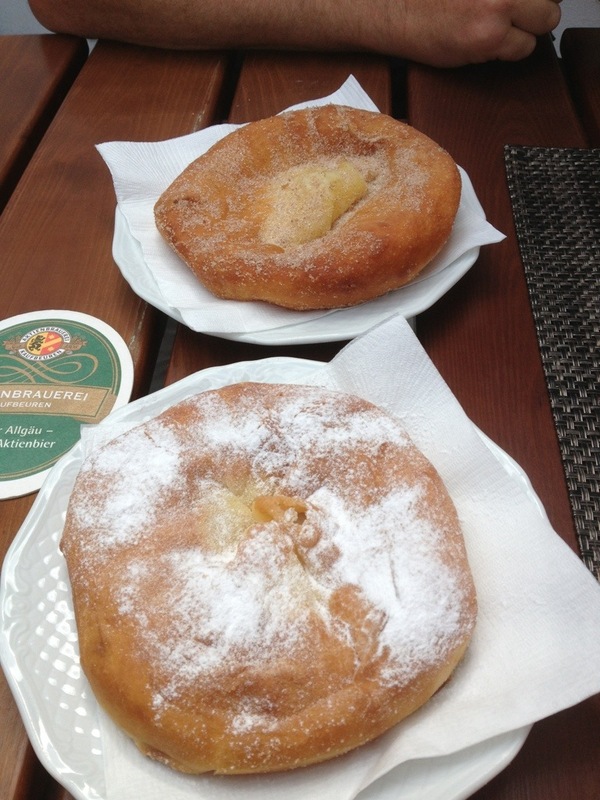 They were freshly made giant ring doughnuts with sugar and cinnamon. I requested one without cinnamon as I’m not keen on it. 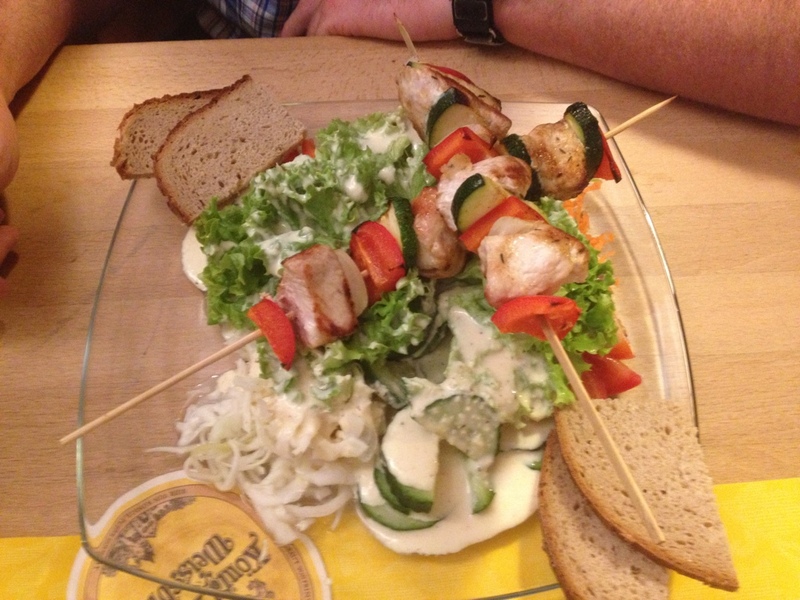 Within minutes both had arrived – mega yummy! 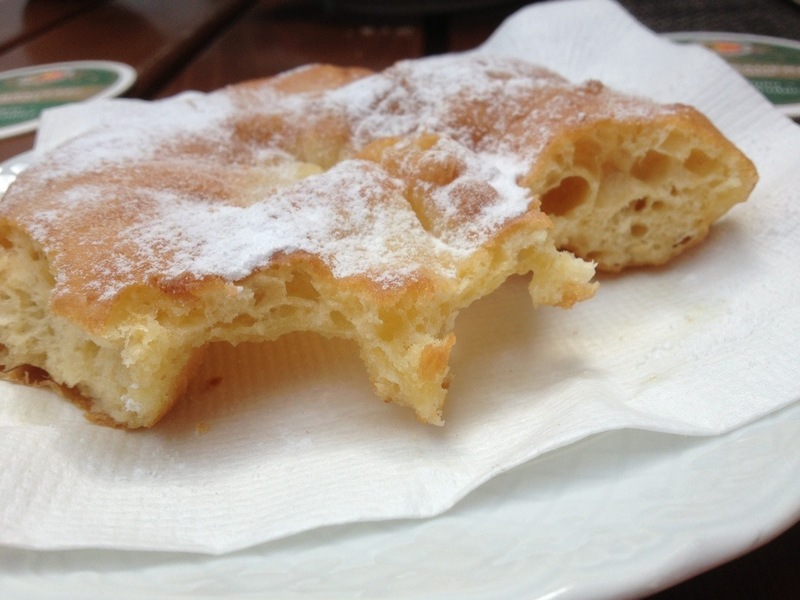 Light and fluffy inside too! 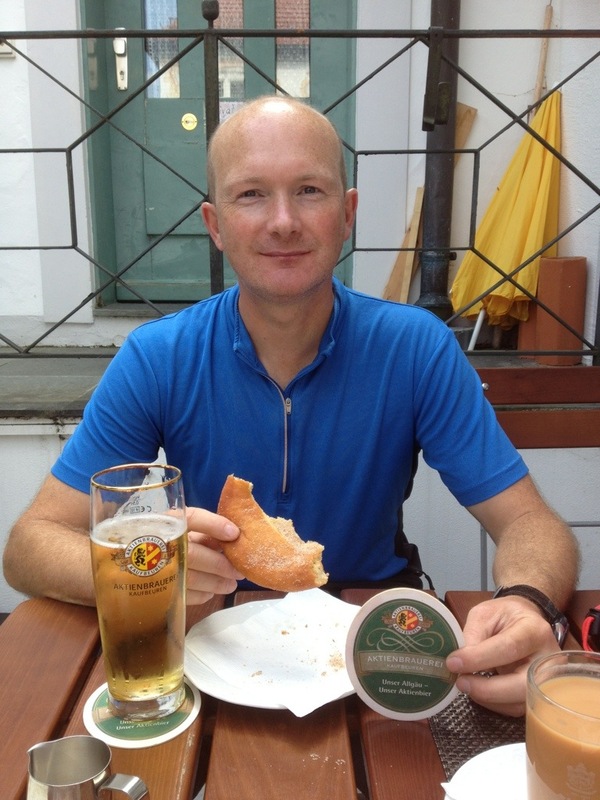 And as it was the first proper day of cycling James had a Radler (half beer, half lemonade). It was 10 to 2 when we were ready to set off after a nice break and food and chance to chill out. We were halfway to our destination – it’s a short day of 32 miles but we had a fair few ups and downs to come. 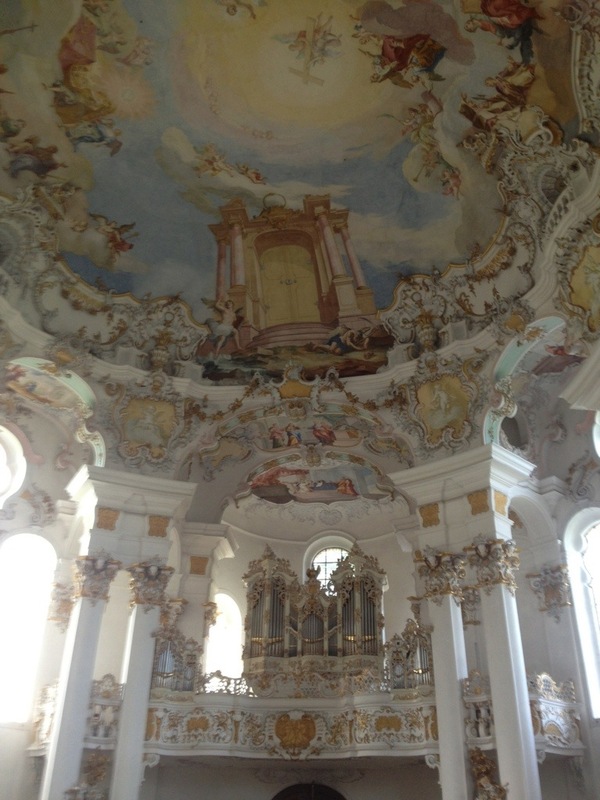 This is looking back at the beautiful Wieskirche. From this point the official cycle route splits two ways. We decided to take the easternmost route which our English guide book suggested took in more of the beautiful towns on route. 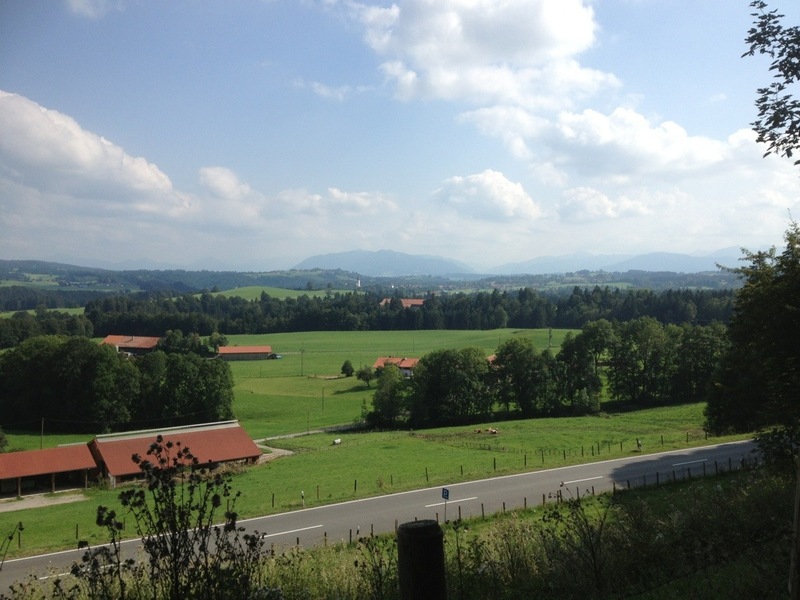 This was possibly a more hilly route though as we discovered as we made our way up the very steep hill into Wildsteig. This photo is looking back down the hill – James had gone up quite fast and managed to twist the end on his handlebar as he was hanging on to it as he powered up the hill! A bit of forward planning and studying the Bikeline German guide book maps showed us the next section was off road with loads of ups and downs, including several very steep bits. 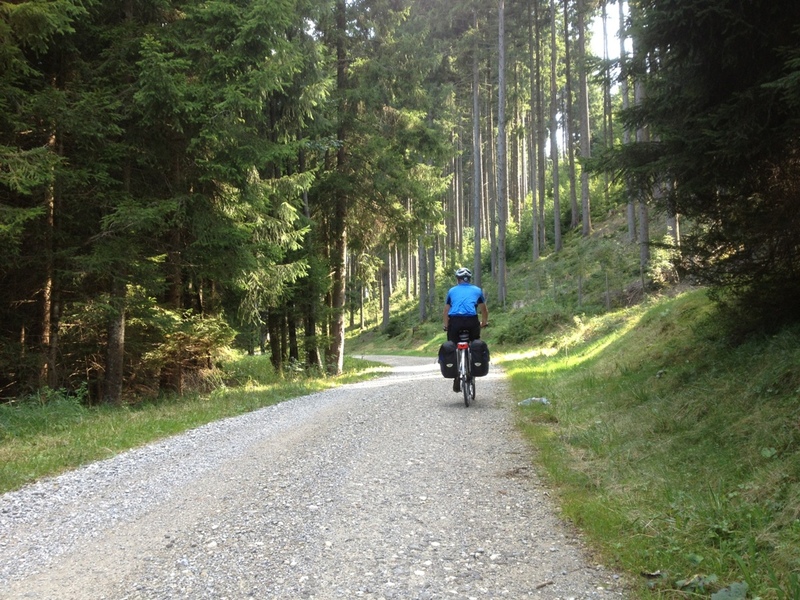 However the main road took a less hilly route and was only slightly longer so we decided to use that instead. This turned out to be an excellent plan as we had a fantastic swooping down hill and I got up to 38 mph! 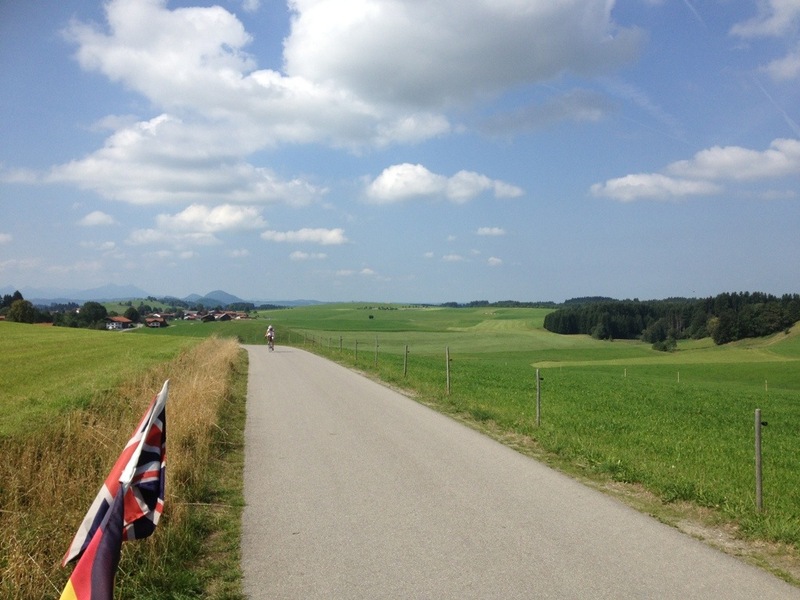 We joined up with the official route just before Rottenburg. At Rottenberg we nearly went wrong and missed an underpass but a man standing in his front garden told us the correct route. Very helpful chap! 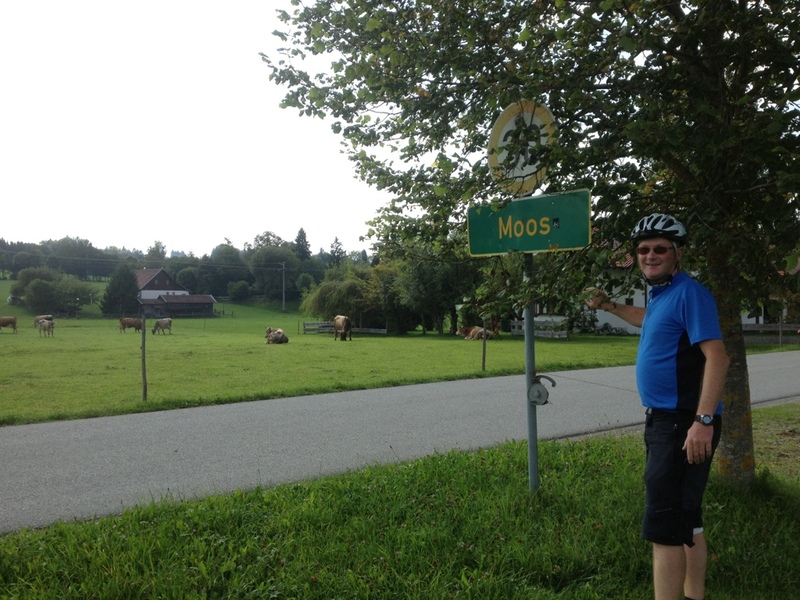 We continued on along the official route which was through a very quiet hamlet which rejoiced in the name Moos. 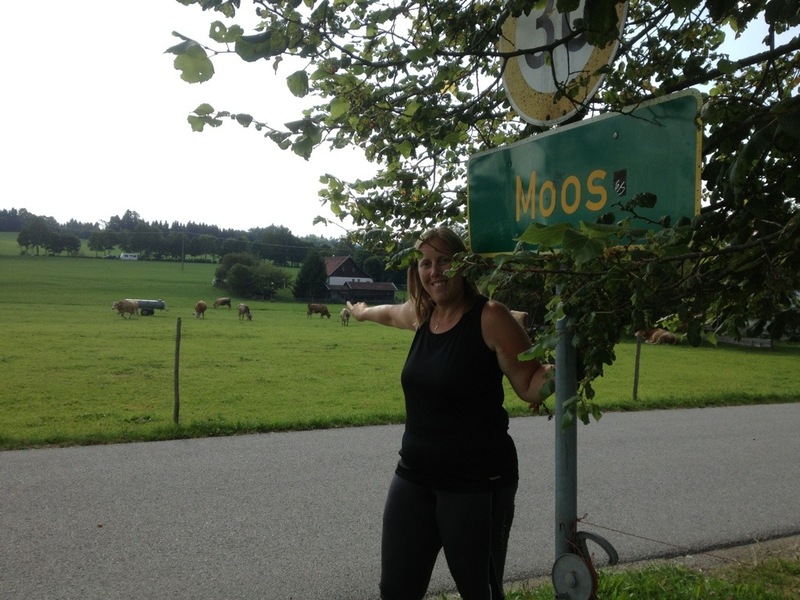 Cue lots of photos of cows and the village sign! 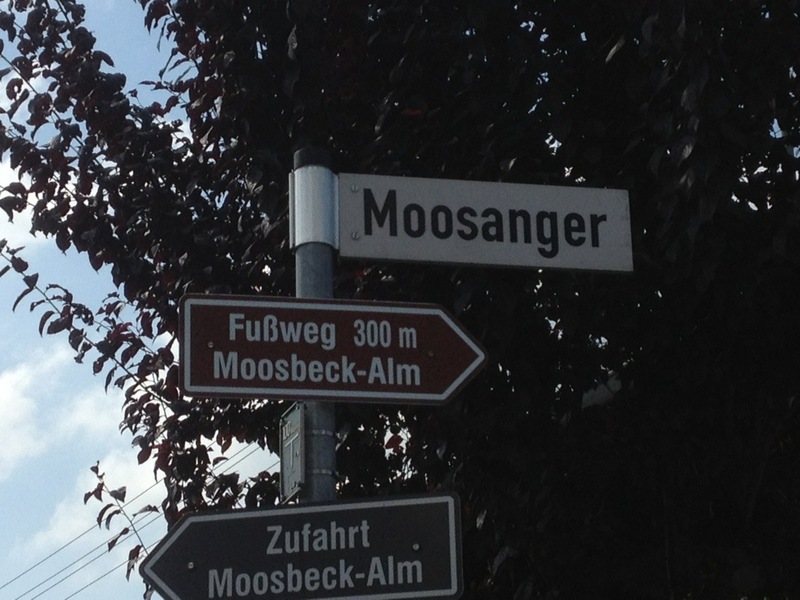 I liked this road name too. We then followed the cycle route beside the main road the B23 with a couple of short climbs but nothing too strenuous. 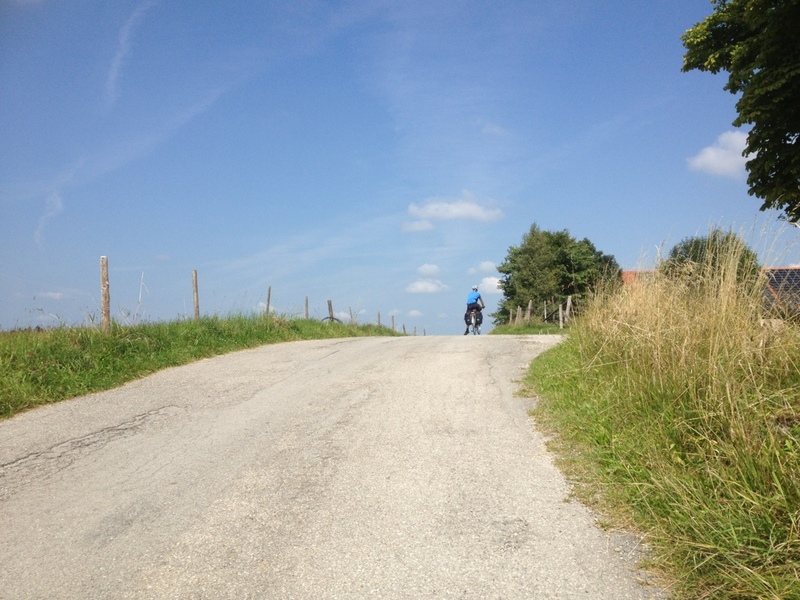 There was one more significant climb which went over a small hill where the main road diverted round it. This included a rather exciting 20% descent – you can see the sign here. I waited for the tractor to pass before I headed down. Sadly I couldn’t get up much speed down here as I was following a car and he was being very careful. We saw four tractors go past in close succession. 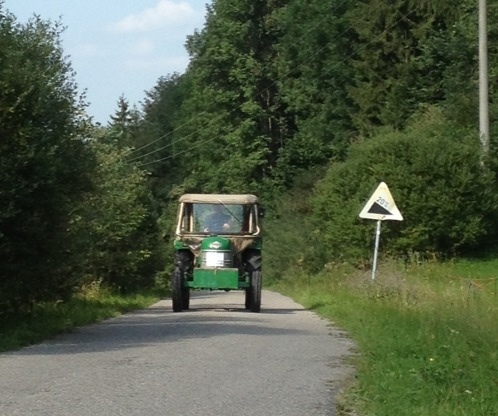 They were all very interesting old ones and one of the drivers was wearing traditional dress so we wondered if there was some kind of Bavarian tractor rally going on. 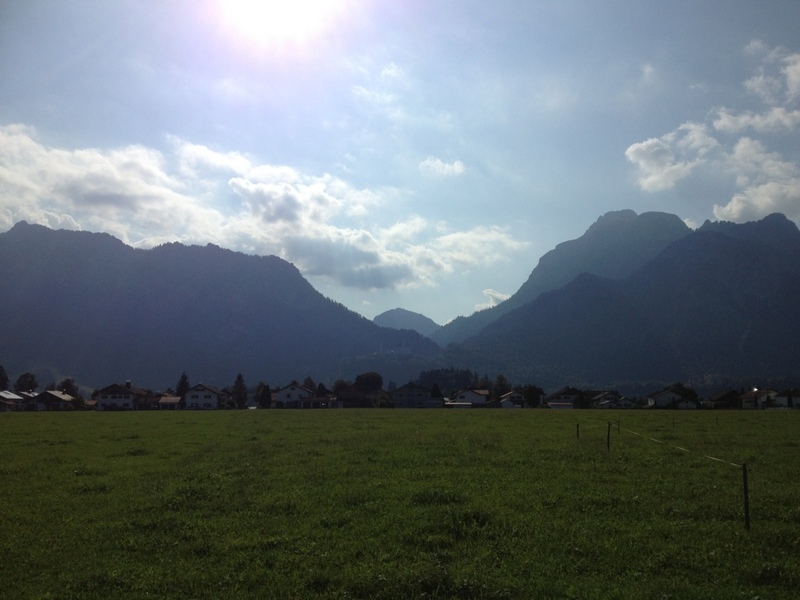 Here is a look back to the Alps just before they went out of sight for good on this tour. We had to cross over and under the main road on a few occasions and I was rather impressed by this set of paths as it gave wide vehicles like mine a good turning circle to make the corner! 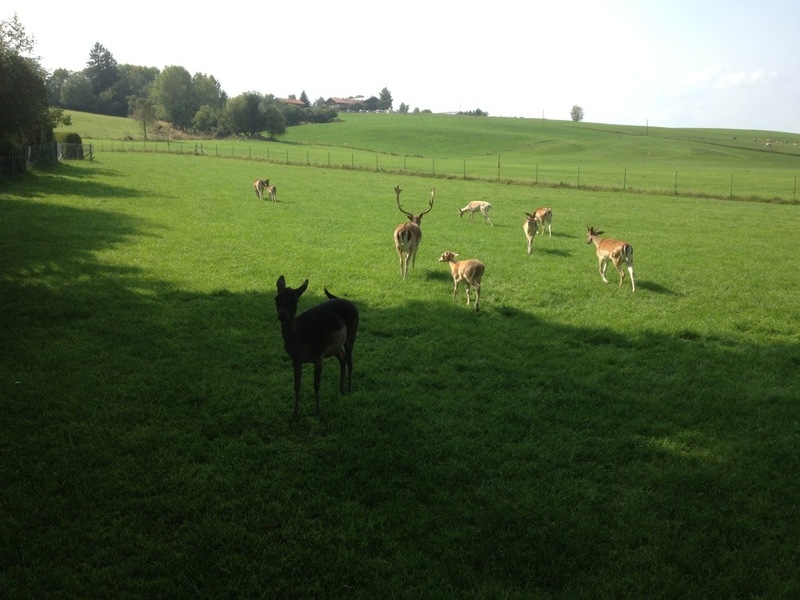 Here is some local wildlife. As we approached Peiting there was a disagreement between our satnav route and the cycle route signs. 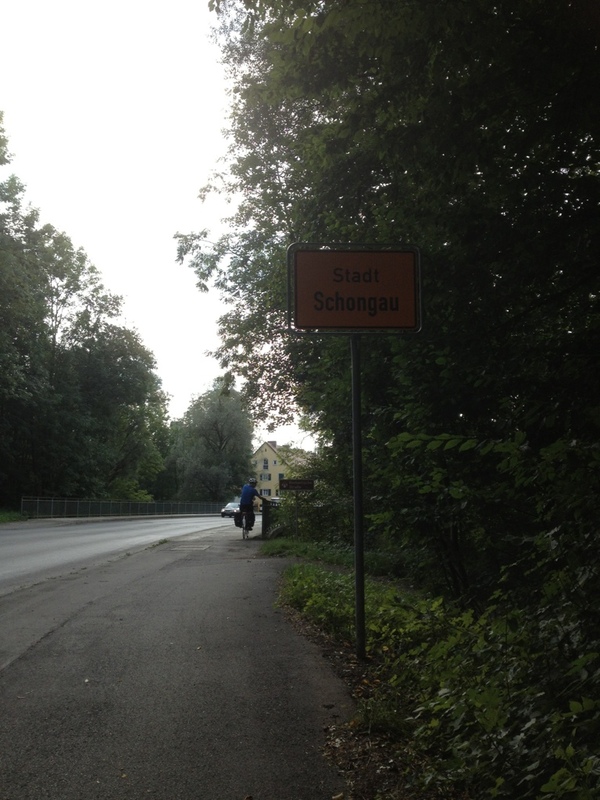 We ended up going with the satnav route into Peiting which passed the road sign for the Romantische Strasse. The road route and cycle route are actually quite different, I believe the cycle route is 30% longer, for example. As the bikes are kept away from the main roads we don’t see these signs all that often. At Peiting I saw an Aldi supermarket so stopped to get some biscuits to keep us going when we got to the hotel. 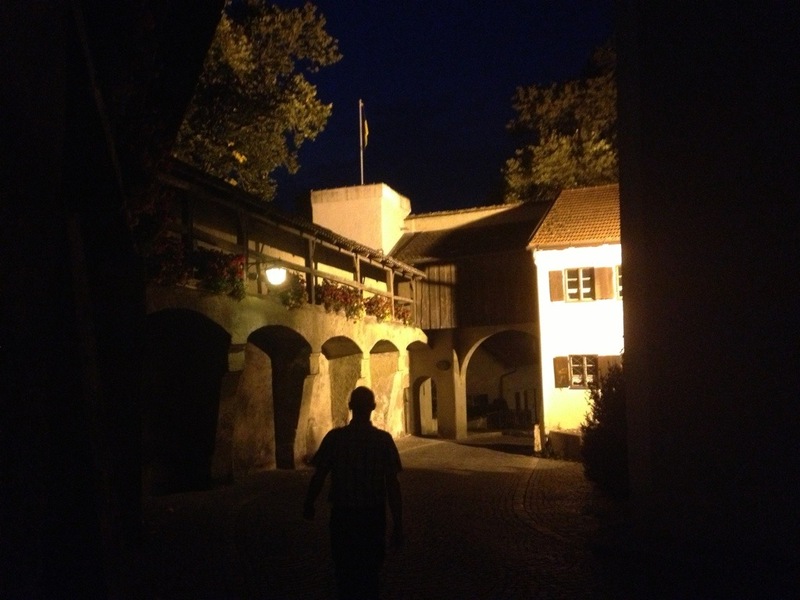 Here we are entering Schongau, our town for this evening. 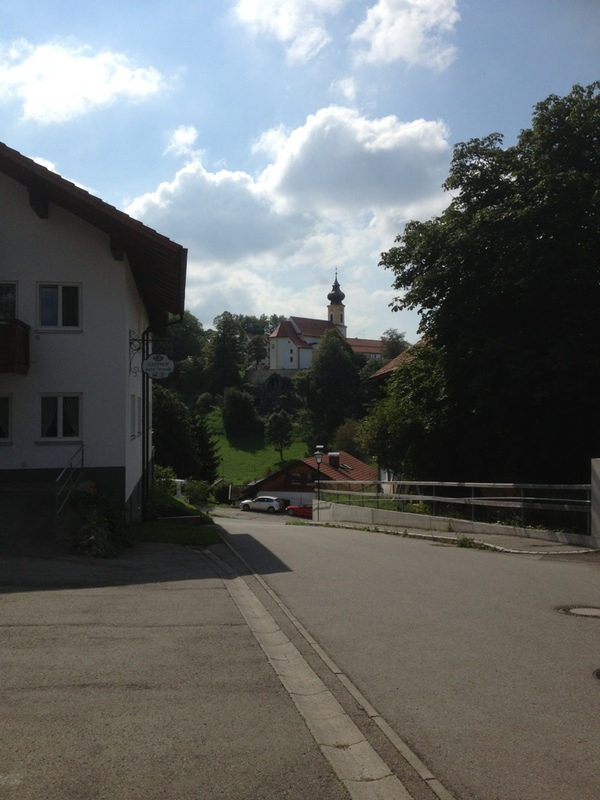 Schongau turned out to be rather hilly and we did a detour to reach our hotel to avoid going over an enormous hill. The hotel itself was up a hill and we ended up walking the final 10 metres to the hotel reception area. At the same time as we arrived a large group of cyclists rolled up. 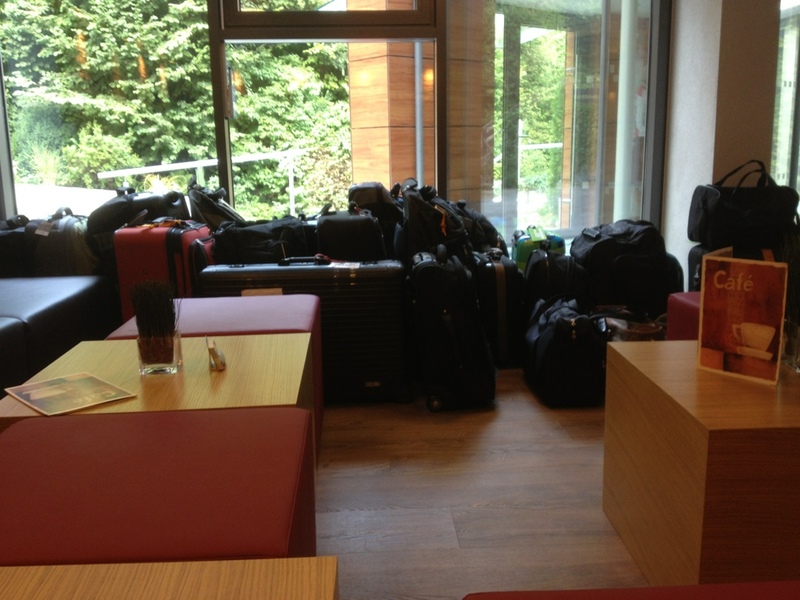 They had no luggage with them, it turned out to have been delivered for them. 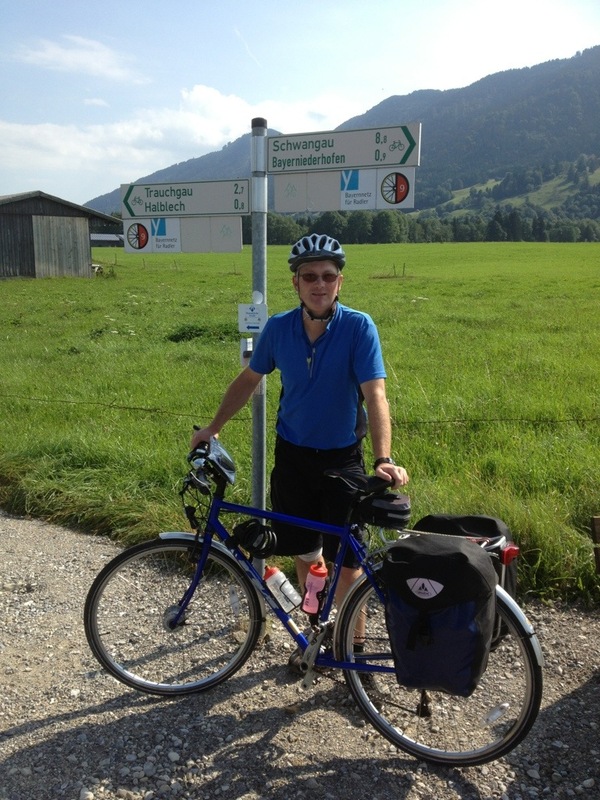 They had enormous suitcases – that is cycle touring with all the luxuries. The receptionist told us that the bicycle parking was back down the hill again under the hotel which is built into the hill so we got to cycle or walk down that steep ramp again. 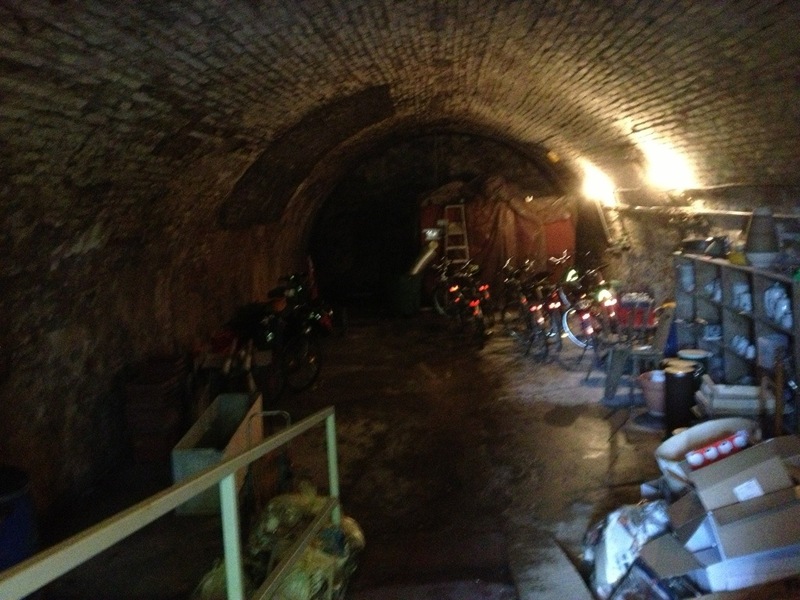 The bike parking turned out to be the wine cellar – it was dark and cool and had a small stream running down the middle. A very unusual alternative to our shed at home for the bikes. 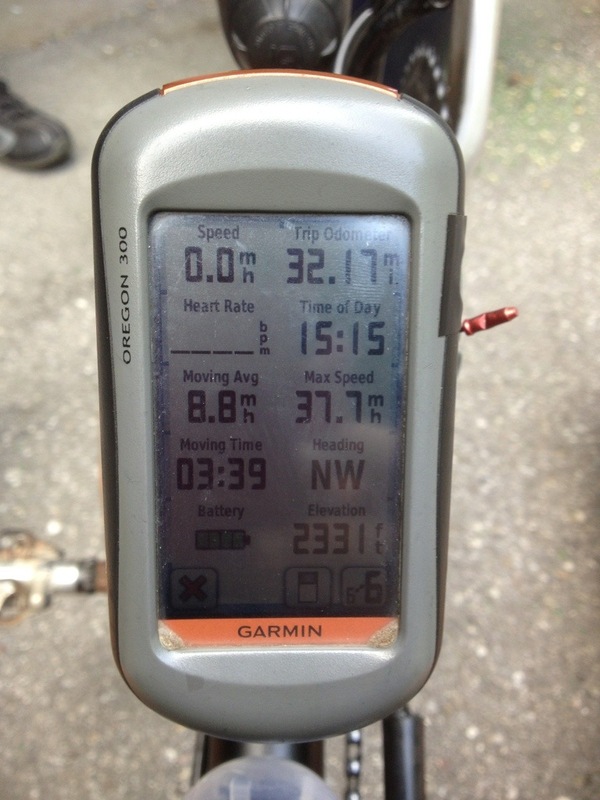 I took a photo of my Garmin for today’s figures. We cycled just over 32 miles and at a very leisurely 8.8 mph. It was lovely to stop regularly and look around at the scenery so we were very happy with how we rode today. After the traditional shower, writing up of the blog, washing clothes, generally faffing about it was time to go out for our evening meal. 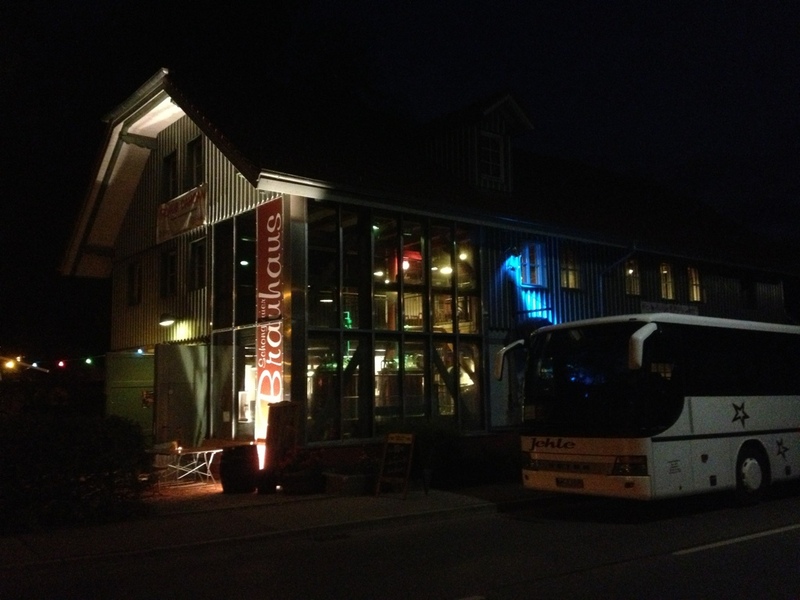 We are staying in hotel Holl which has a restaurant but it is closed at the weekend. The receptionist told us about the Brewery down the road which I had seen on our way here. They did food. 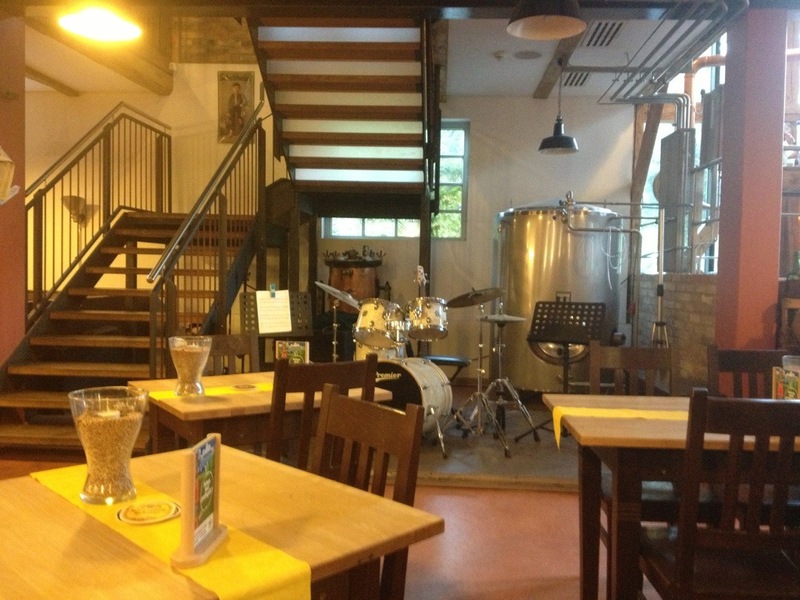 So we wandered down together, took a seat and enjoyed the surroundings of a brewery plus restaurant. 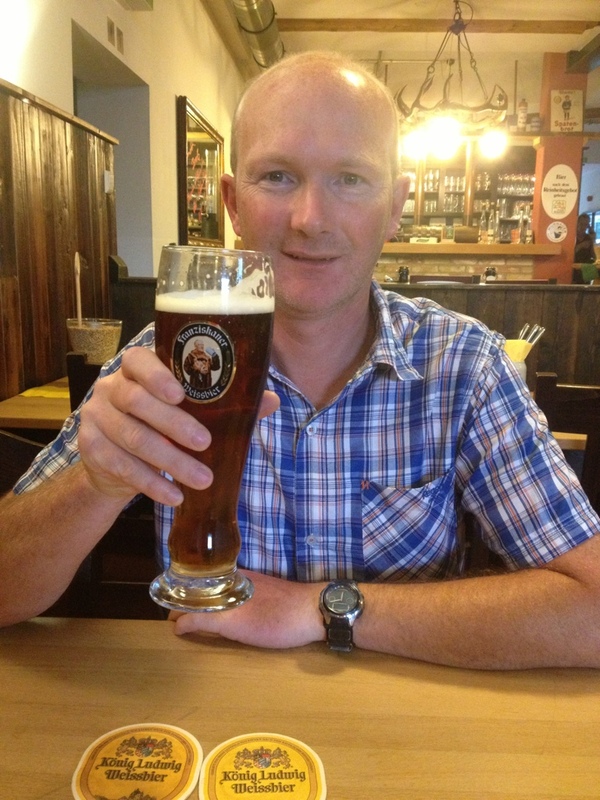 James ordered a Weissbier which was brewed at this brewery. (The glass is from a different brewery). 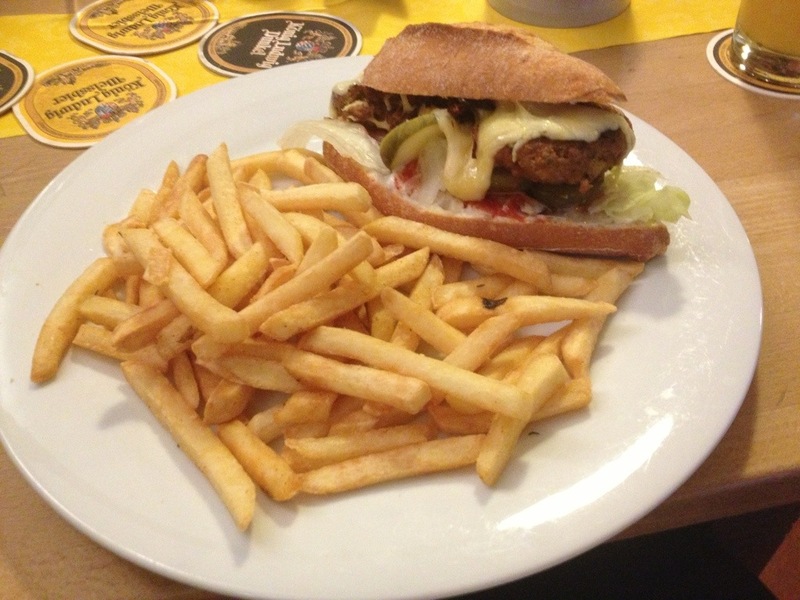 We ordered food, James had a chicken kebab from their barbecue, I had a German style burger. 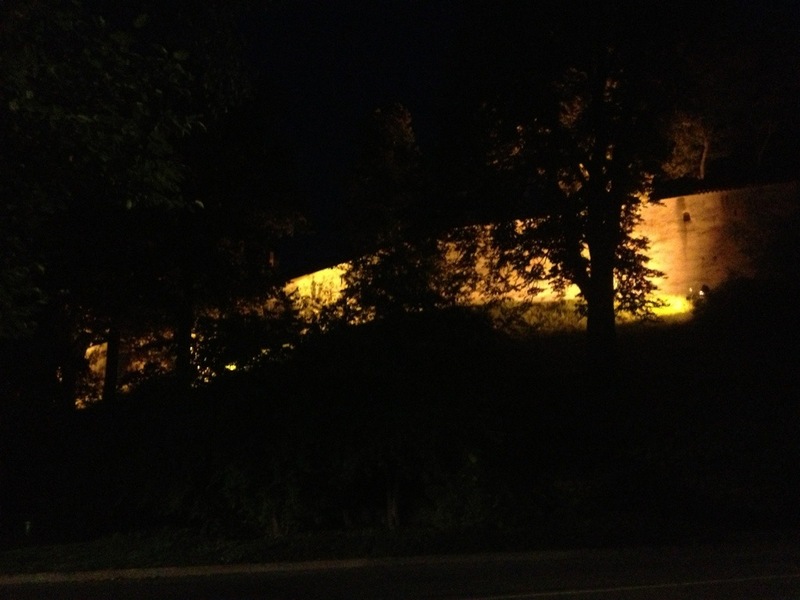 After our meal, although it was dark we thought it worth visiting the town walls which are very impressive. 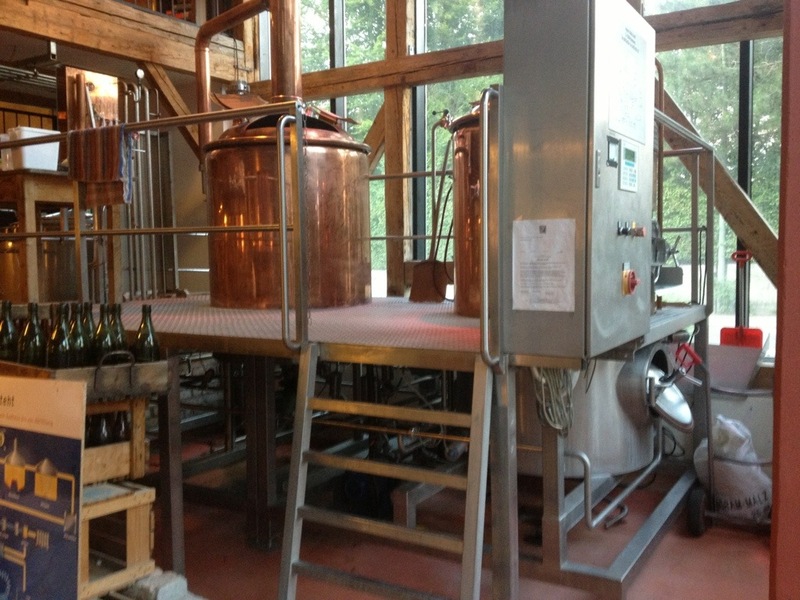 This is the view of the outside of the brewery. From here we walked for five minutes to the town walls. 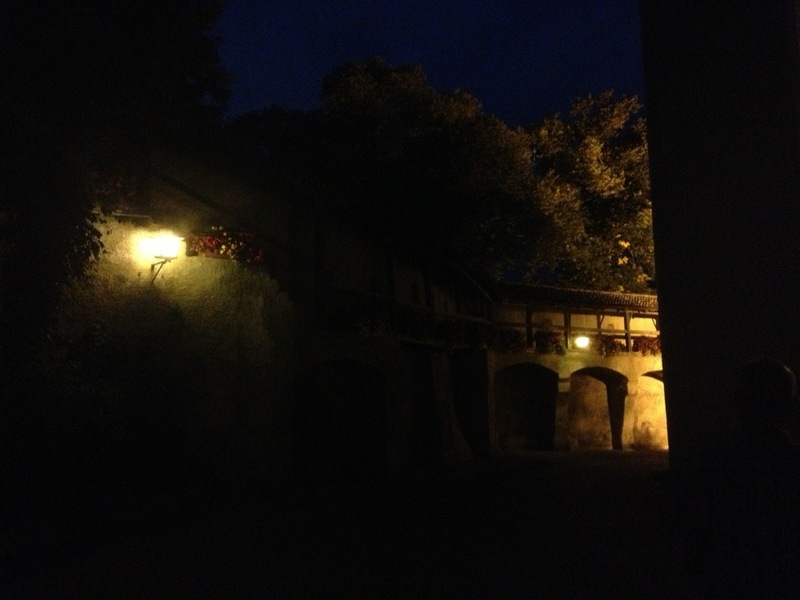 They were nicely floodlit – I’m not sure how effective the photos are but hopefully it gives you an impression. 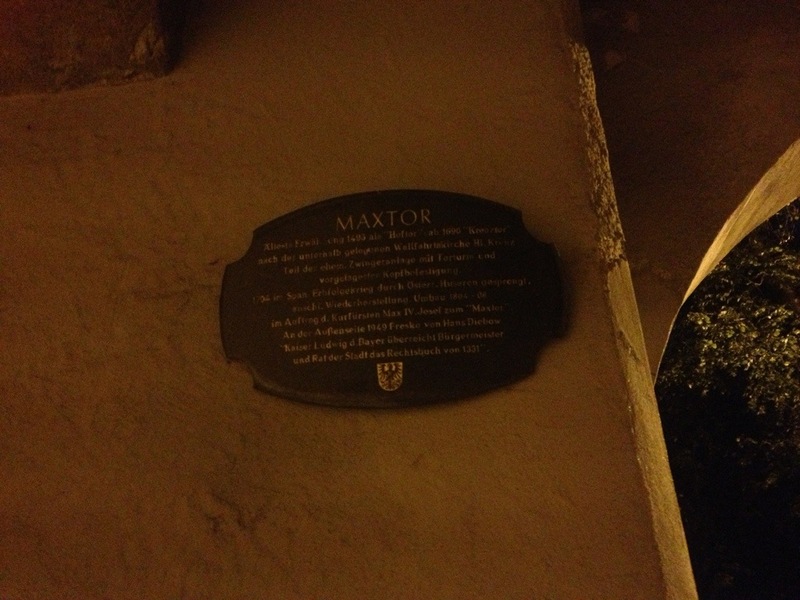 We had a little walk through the town inside the walls and then came out of the Maxtor Gate and walked back to the hotel. We had a message from a friend who lives near here to say she may be able to meet us on Monday with her partner whom we also know. That’d be great, hopefully we can sort it out. They are both keen cyclists so perhaps we’ll be able to have a bit of a ride together. 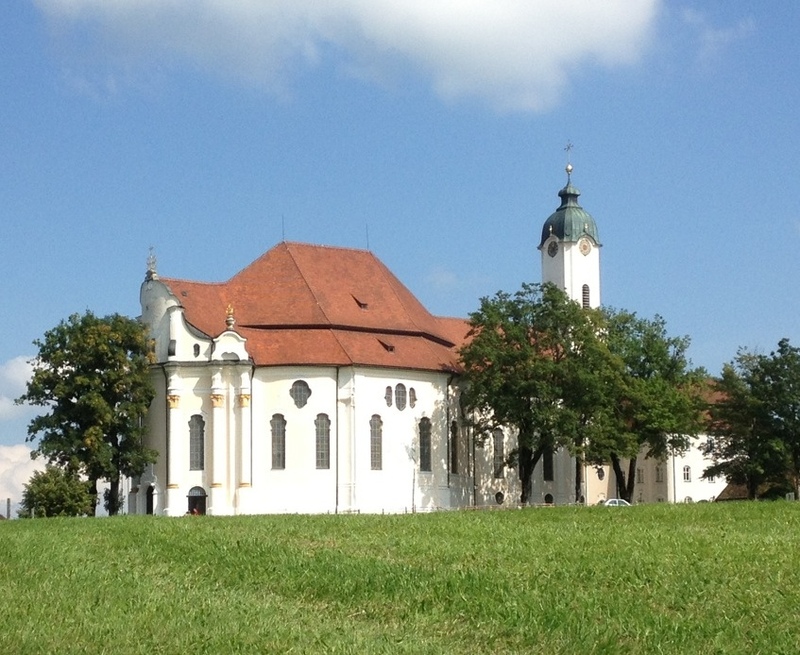 Tomorrow we are heading to just south of Augsburg to a place called Königsbrunn. The weather forecast is reasonable although we may get a small amount of rain. Monday onwards looks a bit cooler and wetter, but it won’t dampen our spirits at all! This tour leaves Potsdamer Platz and goes through Kreuzberg via Tempelhof airport, then along to the East Side Gallery at the Ostbahnhof – this is a gallery of paintings on the former Wall. It’s about 12 miles. The GPS file shown above is in reverse for some unknown reason – I (and the guide book!) started the ride at Potsdamer Platz which is on the left of the map. The forecast for today was very heavy showers but as I left my apartment the sky was blue and the sun shining. It was rather windy, however, which made for an amusing journey down Straße des 17 Juni as acorns were falling all around me – I reckon one of those would hurt if it hit me on the head but fortunately I was lucky and avoided that. This tour started at Potsdamer Platz so I did my usual route there; not the shortest route (through the Tiergarten) but the main road route which goes past the Brandenburg Gate. On the way, opposite the big memorial park of grey stelae for the holocaust, I looked out for (and finally found) the newest addition to that memorial. It’s on the other side of the road, set slightly back from the road in a small clearing in the park. 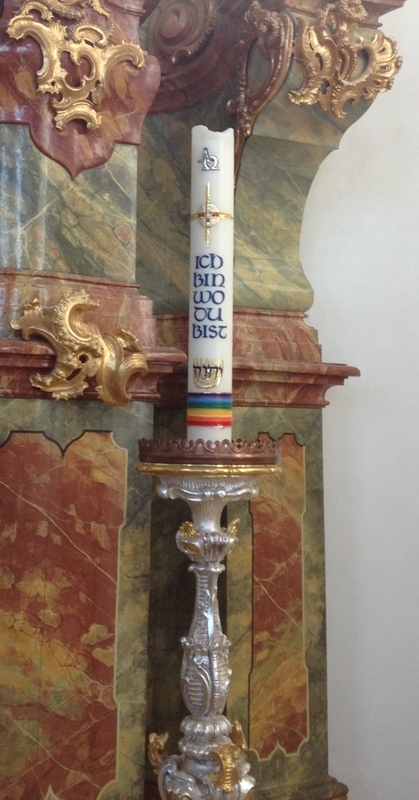 This is a memorial to the homosexual people who were killed by the Nazi regime. It’s 3.6m high and 1.9m wide and is a stone cube with a window. Through the window you can see a short film. I was very puzzled as to how they get into the memorial to service it or repair the film or anything – I couldn’t see a single access point. I can only assume that there’s a way in from underneath, or something. 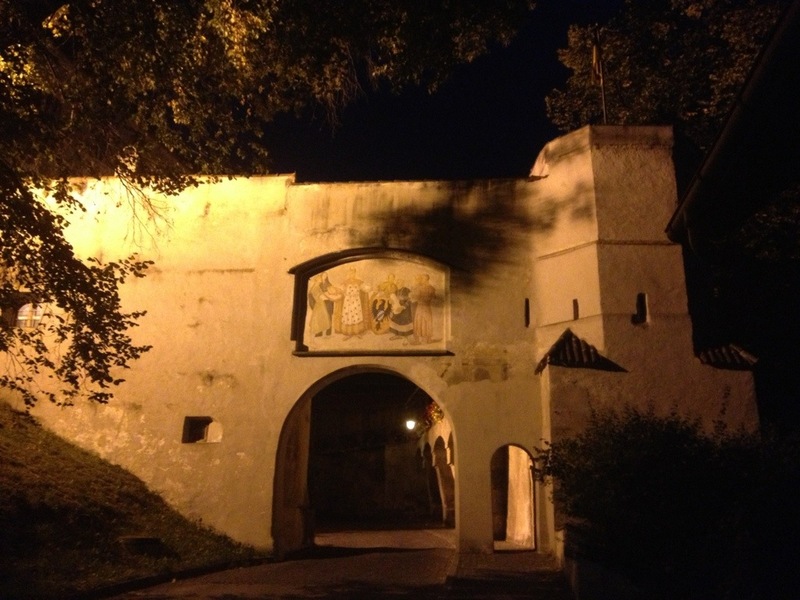 I continued on along Stresemannstraße before turning right just past Schönebergstraße. Once again I passed this ruin and decided to photograph it. Reading through the guidebook now I discover this is the very front of the old Anhalter Bahnhof railway station. It was a huge complex which had fallen into disuse in 1952, partly due to war damage but also because of its part in the story of the holocaust – from June 1942 trains left there to deport Jews to Theresienstadt (in the Czech Republic). The Jews were transported in two carriages which were attached to the third class carriages of regular trains. 116 trains transported around 9600 people. Just behind the old Anhalter Bahnhof front is the Tempodrom, a sport place in the old Anhalter Bahnhof grounds. 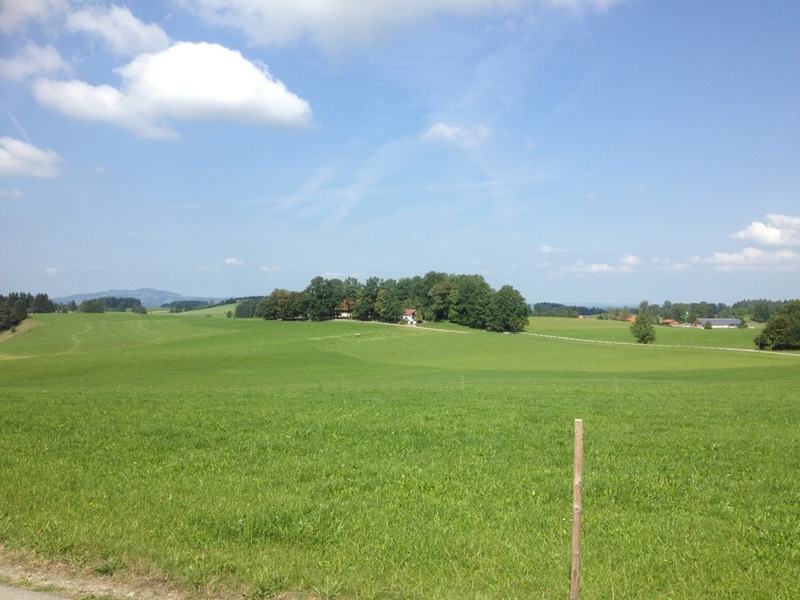 I then found myself cycling over Gleisdreieck which is a U-Bahn station. 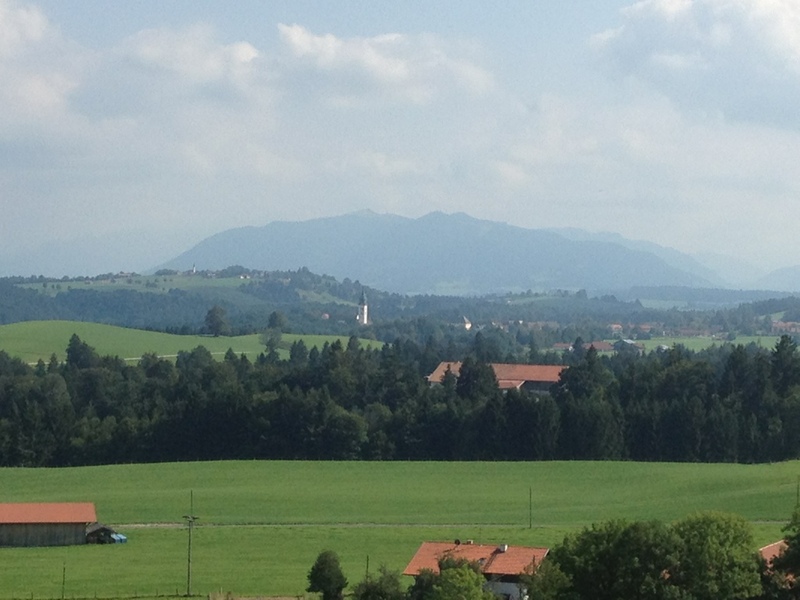 However, what struck me when cycling over Gleisdreieck wasn’t the trains, it was the DC-3 hanging from a building. Later on in the tour I found somewhere where a DC-3 was missing so perhaps it was this one! These are part of the Deutsches Technikmuseum of Berlin which is one of those museums you could spend days in and never get bored! I’ve visited it multiple times and there’s always new interesting stuff. I pootled on for a while before arriving at Viktoriapark in Kreuzberg. I was rather impressed by this waterfall! I should have known, however, that the author of this guide book would have me cycling up to the top. I’ve gone up every high place there is in Berlin, it seems, following the Berlin Erfahren routes! A steep climb in my lowest gear got me up to the Tempelhofer Berg, a 66 metre high bit of Berlin which used to have vines grown on it (no longer). 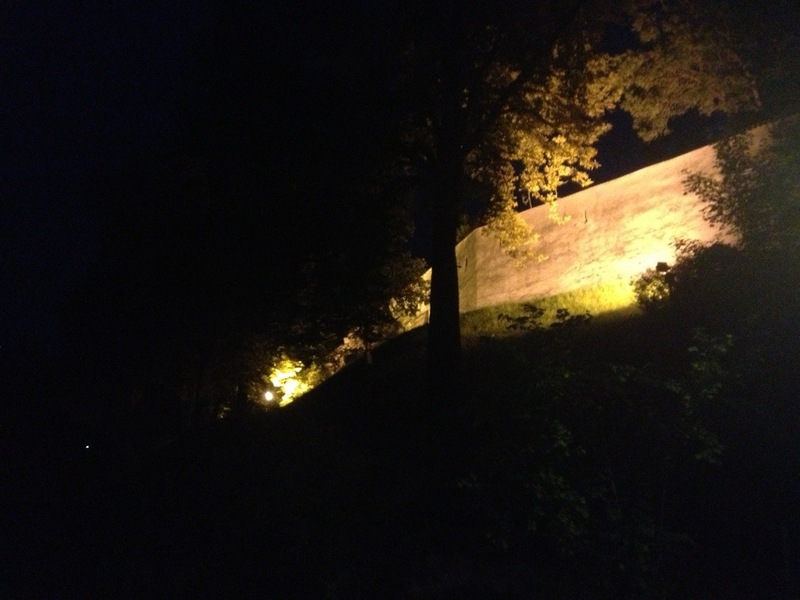 At the top of this is a 20 metre high “Kreuzbergdenkmal”, a memorial, from which the waterfall starts. There’s a good view from the top. From here a very quick descent led me to the former Schultheiss Brauerei, an old brewery (the beer is still brewed today but clearly elsewhere) which is being converted into oh-so-posh apartments. The cobbled streets and periodic flights of steps made this a pain in the neck to cycle round. Now I found myself at Tempelhof Airport again, which of course I had been round a few days ago, so I whizzed down Columbiadamm to get to the next point of interest (which happened to be a mosque). On the way my attention was taken by this large sign. Thing is, there was no DC-3 there. 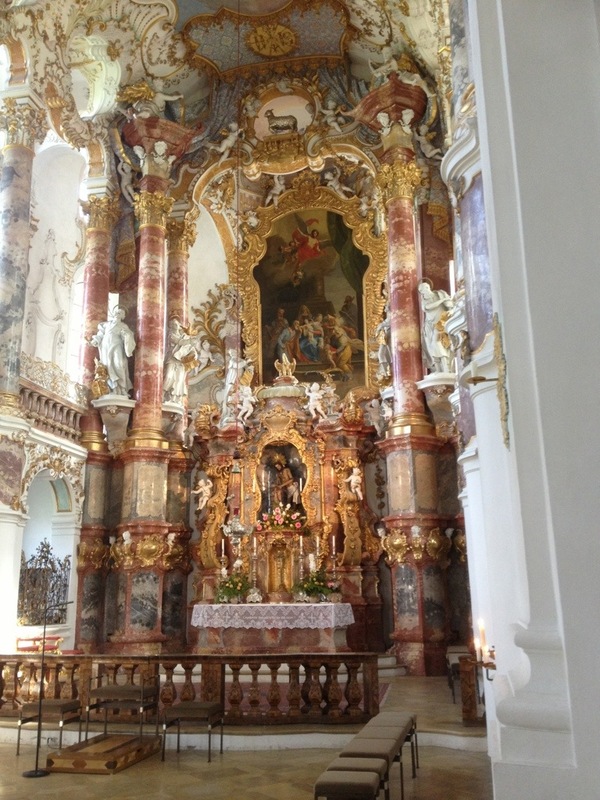 Perhaps someone had pinched it and hung it from a building at Gleisdreieck. Saw the mosque, then cycled through Volkspark Hasenheide which had lots of people walking dogs and cycling. I then carried on along some streets before arriving at Görlitzer Park which actually seemed a bit of a mess. It was created in the 1990s when the former Görlitzer Bahnhof (station) was taken down and still has obvious areas where rail tracks were – rather like a lot of the UK cycle paths. They were digging up the path where I wanted to go so I had to find an alternative route. Which suddenly involved a big pile of stand which acted as a very effective brake. I’m glad I had an Alfine hub rather than the derailleur on my other trike as that would undoubtedly have been full of sand at this point. The chain tensioner was almost too low for this trike! And then when I got to the end of this former railway line, I had to contend with some steps. Lovely. I now found my way to Treptower Park which had a huge Soviet war memorial, with two very imposing gates as you go into and come out of the park. I then found myself at Flutgraben which is where the Landwehr Canal and the Spree River join. I saw this memorial plaque but Wikipedia doesn’t seem to know anything about it. I stopped here for a crepe. And to be amused at the unfortunate name for this café. I saw myself in a shop window so took a pic. I had stopped off earlier at a little local shop which had various mobile phone things to buy a cover for my cracked camera screen (which I have now fitted and works very well). I had a 10 minute chat with the shop owner who was interested in my trike and looked at various bits. 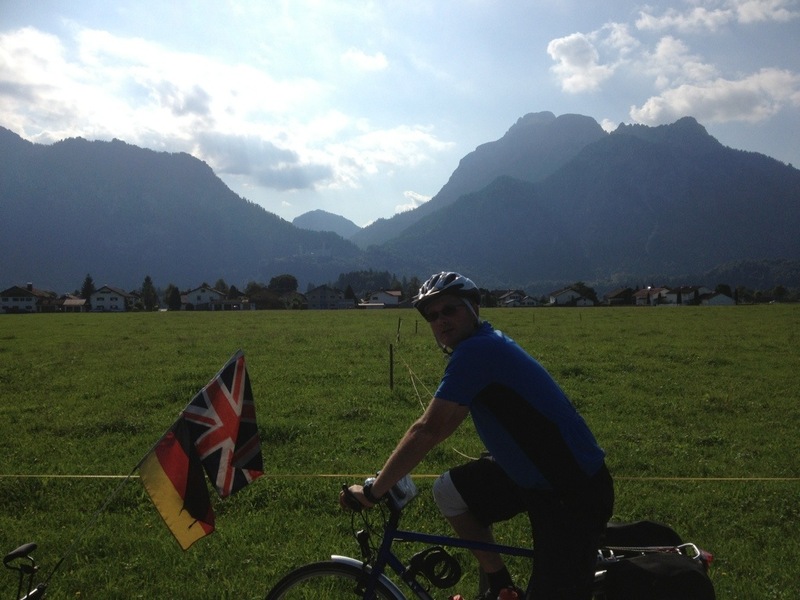 He seemed really excited that I had Schwalbe tyres – they are German, you know, he said. I did know, and I then pointed out the Schmidt Dynohub (that’s German) and the Busch & Müller front and rear lights (they’re German) which are much more interested but he wasn’t that impressed. Clearly tyres are his thing. Anyway, I continued on going the wrong way over one bridge initially as the correct track wasn’t very obvious. I sorted myself out eventually and found myself going into a roaring headwind along the bank of the Spree. Whereupon I saw a huge metal sculpture rising out of the water. There was a plaque which explained it a bit. 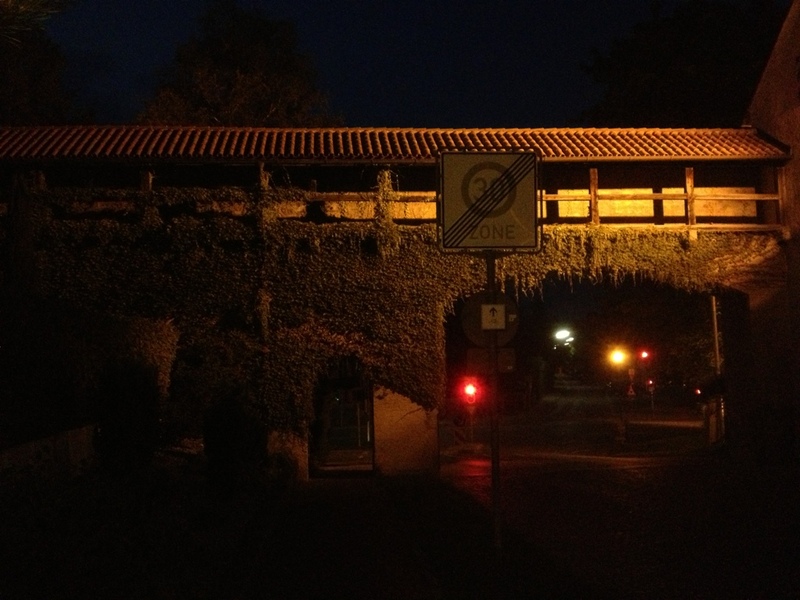 Then I crossed over the Oberbaumbrücke which links Kreuzberg with the district of Friedrichshain. The middle span of the bridge is rather less attractive than the ones either side. According to my guide book, Adolf Hitler had the middle span removed to try to slow down the Red Army’s march into Berlin. I was then at the East Side Gallery again which I visited on a ride earlier in the week. From here it was a direct route home as I had finished the tour once I got to the Ostbahnhof. Whilst pootling along I saw the Berlin equivalent of Boris Bikes, whose control mechanism thingie appears to be solar powered. There was a chap there cleaning everything and maintaining the bikes, except he knocked one over! 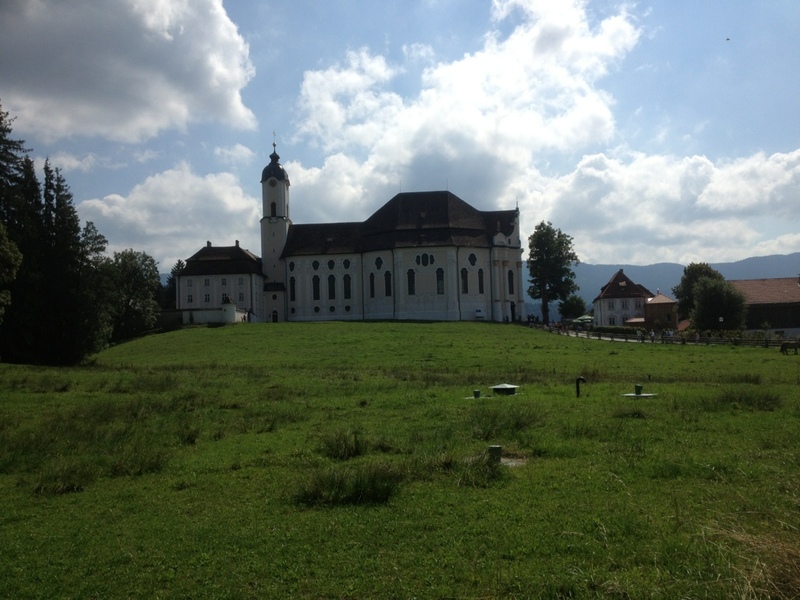 On my way back I cycled past the Rotes Rathaus. I took this pic when stopped at some traffic lights. I have refrained from taking yet another photograph of the Brandenburg Gate (aren’t I kind!) 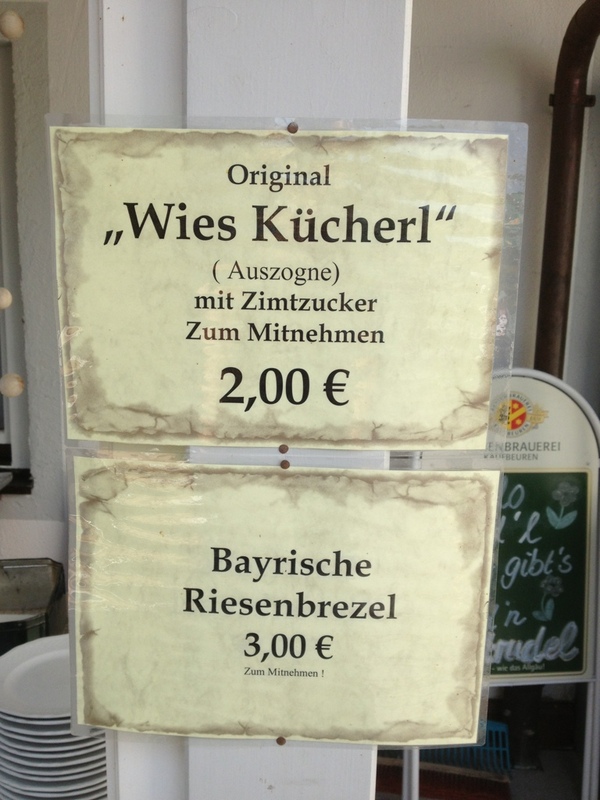 but I did pass this comedy bike at the Siegesäule and took a pic. You usually see them with a bunch of drunk lads helping to pedal. This one seemed rather lonely. Back to my apartment after 22 miles, so a short day today although it took almost five hours in total. This is my last cycling day in Berlin as we drive home tomorrow lunchtime. 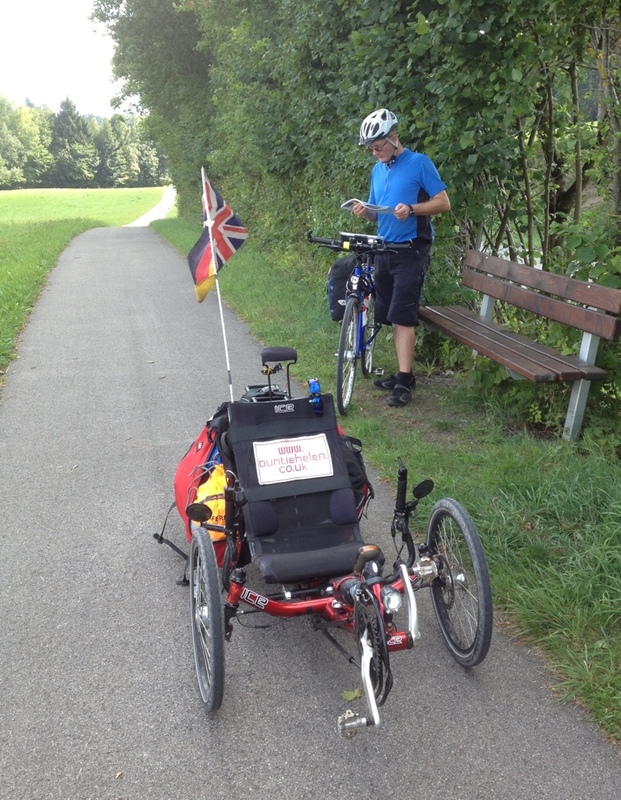 I hope you’ve enjoyed reading about my adventures – next year I shall be cycling from Berlin home to Britain so at least I’ve checked out the first five miles of the 700 mile route!! !